This week Hearts leapfrog Hibs in the SPL, Spartans Under 17s won the Scottish Cup, whilst Spartans and Edinburgh City reach the League Cup Final. There were good wins for Spartans and Hibs Ladies and we send our congratulations to Lynsey Sharp whose European Championship 800m silver medal has been upgraded to gold. On Friday night Edinburgh played the final game of their’s and the Dragon’s season. With the teams languishing in 10th and 11th places in the RaboDirect table there was nothing but the win to play for and Edinburgh snatched that with a 31-24 points victory. Scoring three tries apiece it was the greater penalty tally against the Dragons that told in the end. Going into the second half 25 points to 10 ahead, it was all looking good for the hosts. But a second half scare from the Dragons with two converted tries, brought Edinburgh back to Earth with a bump, but they managed to hold on to take the win in the end. The last but one round of the 2012-13 World Sevens Series was being held over the weekend at Scotstoun in Glasgow, and Scotland had to finish ahead of USA to guarantee core team status – i.e. automatic entry – to the 2103-14 series. However, this ambition went belly-up on Day 1 as, although beating Portugal 26-5 in the opening match, the team lost 29-7 to England and 28-0 to New Zealand to only qualify for the Bowl QF. With USA winning two of their matches and going ahead into the Cup QF’s, this means that, before a ball had been kicked, passed or rucked on Day 2, Scotland were required to go into an eight-team play-off tournament at Twickenham next week, and have to finish in the top three in order to retain their place. Scotland’s Day 2 started well with a 31-5 win against Spain, but they went down 24-19 in the Semi-final to a quick Kenyan side. 17-0 adrift at the break, too many errors cost the Scots team in the end and they went out of the tournament in spite of three second half tries. The Cup final was contested between a rampant South Africa who disposed of England and a tired looking and depleted New Zealand who kept Wales at bay, but only just, with a couple of last minute scores. An epic contest saw South Africa lift the tournament Cup 28-21, but New Zealand took the overall title with one round left to play at Twickenham. And finally, other news this week saw Scott Johnson stand down as Scotland head coach and take up the role as Director of Rugby, with the news also being announced that a successor had been chosen, but who has the job will not be revealed until a later date. Hearts ended a traumatic week in style beating St Mirren 3-0 at Tynecastle thanks to goals from Jamie Walker, Kevin McHattie and Jamie Hamill. The game was played in front of a crowd of 16,312 thanks to the club’s offer of a £5 entrance fee. Some good news for the fans however is that club captain Marius Zaliukas could make an unexpected return from ankle ligament injury in time to play in Hearts’ final SPL match of the season against Aberdeen at ­Pittodrie. The Lithuanian is hopeful of resuming full training next week, and is hopeful of pulling on the maroon jersey at least one more time as his contract is up in the summer and no new deal has been agreed so far. The result means that Hearts leapfrogged Hibs who dropped into 10th place after their away match at Rugby Park was abandoned in the 51st minute when a supporter had a suspected heart attack. Hibs had taken the lead through Alex Harris, but Kris Boyd equalised and the fixture was all square when the referee took the decision to call the game off. Hearts now sit 8th on 42 points with Hibs one point behind having played a game less. The pair meet next weekend at Tynecastle. Edinburgh City will meet Spartans in the final of the East of Scotland League Cup on Saturday 25th May. City beat Leith Athletic 4-0 in the semi-final thanks to a Robbie Ross hat-trick after Dougie Gair had given them the lead with well struck free-kick. Spartans secured the other place in the final with a 2-0 victory away to Stirling University. The Ainslie Park team took the lead in the 21st minute thanks to an own goal from defender Jason Atkins following a Kevin Motion free-kick. Spartans wrapped the game up with 19 minutes remaining when another Motion free-kick was headed into the net by defender Ally MacKinnon. They then followed up their cup success with a vital 2-1 victory at home to Preston Athletic on Saturday, despite dreadful weather conditions. Preston opened the scoring in the 33rd minute when Dale O’Hara’s wind assisted cross, flew over keeper Ross Gilpin into the far top corner. Substitute Andy Martin equalised after 75 minutes, after Willie Bremner’s shot was blocked by a defender and the ball fell to his feet. Bremner scored the decisive goal in the 78th minute with a stunning 18 yard shot after a long John Grant pass. Preston were reduced to 10 men when Darren Darling was shown a straight red for a late lunging tackle on Andy Martin and Spartans held on for the important win. Elsewhere in the Central Taxis Premier Division, Edinburgh City lost 5-0 at home to Stirling University, Lothian Thistle Hutchison Vale beat Civil Service Strollers 7-0, Tynecastle beat Gretna 4-3 and Heriot Watt lost 3-0 away to Whitehill Welfare. In the First Division, Leith Athletic lost 4-1 away to Berwick Rangers Reserves, whilst Craigroyston beat Coldstream 2-1. Spartans will play Threave Rovers in the preliminary round of the Ramsden Cup next season. The winners will play in the first round proper. The Lothian and Edinburgh Football (LEAFA) Premier Division 1 sides Sandys who play at Castleview and Edinburgh Rose who play at Duddingston will meet on Tuesday 7 May at Livingston’s Almondvale Stadium in the Amateur East of Scotland Cup Final. The kick-off is 7pm and admission is £5 for adults and £2 for concessions. 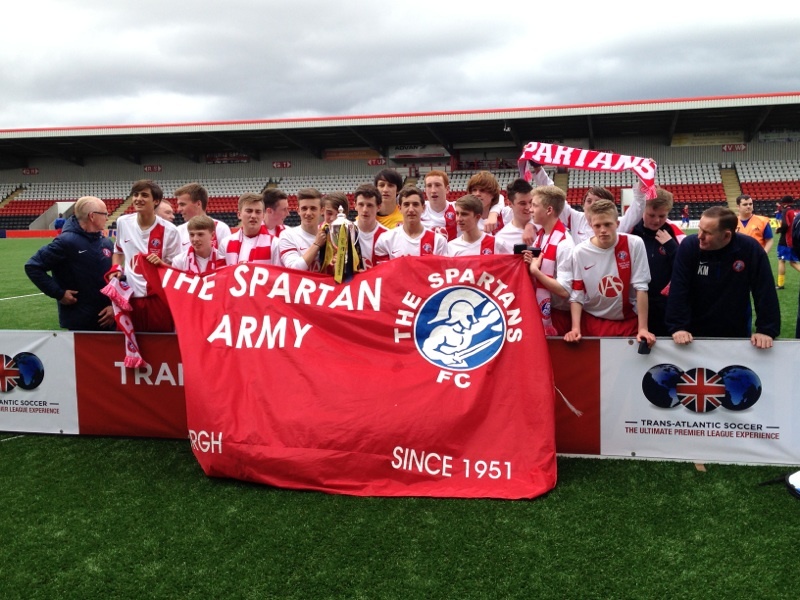 Congratulations to Spartans Under 17s who won the Scottish Cup beating Giffnock 5-0 at Airdrie. Sean Stewart opened the scoring in the 5th minute from close range, and then a few minutes later missed a penalty. Jordan Brown doubled Spartans lead in the 31st minute with a stunning left foot strike and Andy Mair almost made it three just before the break. Congratulations to former Hibs star Kim Little who was named the PFA Women’s Players’ Player of the Year at the prestige award ceremony in London. Kim played for Hibs between 2006-2008 before moving to Arsenal. In the SWPL, Spartans beat Hutchison Vale 5-0 with second half goals from Claire Crosbie, Ellis Jenkins, Diana Barry and Kirsty McLaughlin (2), whilst Hibs beat Buchan 7-0 thanks to goals from Caroline Weir (2) Lizzie Arnott (2) Sammy Hare, Claire Emslie who deserves a special mention on her return to the team and an own goal. Lynsey Sharp will be awarded a European Championship 800 metres gold medal retrospectively after the Russian Athletics Federation confirmed that Russian middle distance champion Yelena Arzhakova had shown “abnormal haemoglobin profile in her biological passport” and as a result has been banned for two years. Her results from 12 July 2011 have been scratched, so she will be stripped of the European 800m title she won in Helsinki last year, beating Lynsey into second place. Scottish Athletics said it will push for a proper medal ceremony for Sharp, possibly at its annual awards dinner this autumn. Edinburgh Monarchs’ fixture against Scunthorpe Scorpions on Friday night was cancelled due to bad weather conditions in Armadale. They have a blank night on 24th May and hope to re-schedule the fixture for then depending on Scunthorpe’s commitments. The Monarchs are due to play the Scorpions in Scunthorpe on Monday night, then will take on Glasgow Tigers in the League Cup on Friday 10 May at Armadale. Edinburgh Capitals’ top scorer Rene Jarolin has signed for HC Dukla Senica who play in the second tier his home country of Slovakia. Jarolin scored 75 goals in his two years with the Caps decided to leave after his family failed to settle in Edinburgh. Some good news to report from Murrayfield Ice Rink however as Coach Richard Hartmann has secured the services of defenceman Danny McIntyre for another season. Danny’s father Duncan was a great servant to the Murrayfield Racers and now coaches with the Murrayfield Junior Development structure. Stan Crombie, Troy O’Connor and Graham Chung won the Federation Shield at Torphin Hill with a gross score of 229. O’Connor’s 69 won the prize for best individual gross score. The Marcus Ward Trophy, for the best net score of 217, was won by David Morrans, Neil Miller and Kevin Duss. Edinburgh youngster Doug Kempsell helped Scotland to a 3-1 victory over Switzerland at the European Team Squash Championships in Amsterdam. Kempsell beat Andrea Torricini then followed that up with a 3-11, 11-3, 11-4, 11-3 evening victory over Lukas Burkhart. Scotland’s men finished fourth after losing to France in the semi-final then Germany in the third/fourth play-off.